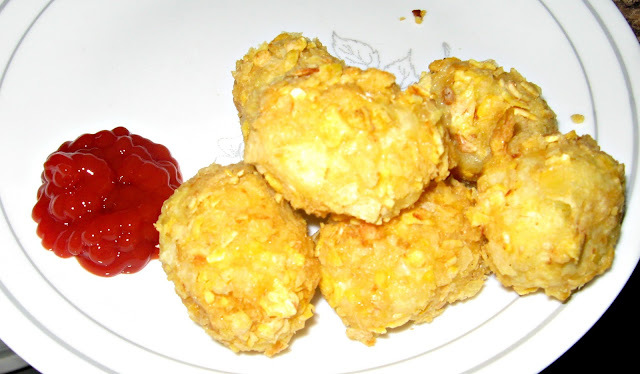 The Cooking Actress: Homemade, Baked Tater Tots! Boil potatoes in a large pot, just covered with water, until fork tender (about 20 minutes). Gradually add milk and mash-you want it to be a little dry and lumpy. Put eggs, flour, and crushed chips in 3 separate bowls. Form potatoes into 1 in. balls and place on parchment or wax paper. 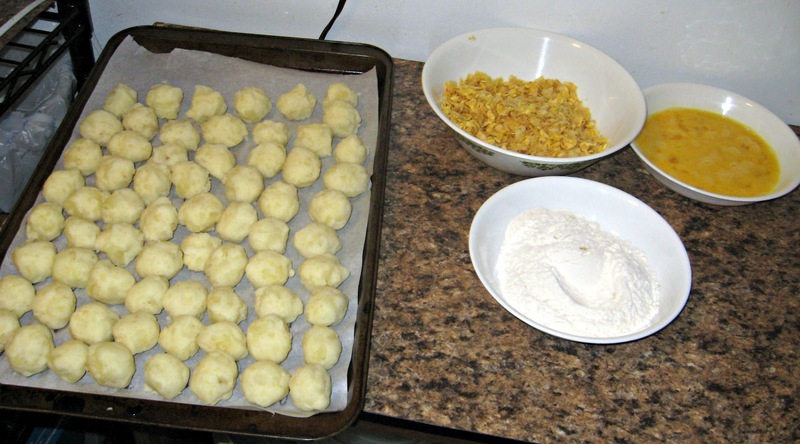 Roll each ball in flour, then eggs, then chips. Form with hands into tot shapes. Place on a baking sheet, sprayed with non-stick spray. Bake in an oven, preheated to 400 degrees, for 12-15 minutes. Yup, these look like some work. Yup, they look totally worth it! Wow, what a great recipe that I'd love to make one of these days when I have some time. My poor boyfriend, I completely underestimated the amount of time these would take and the poor hungry boy had to wait. I have already e-mailed myself this recipe and will be making them this weekend! Thank you for sharing! I can imagine these as a side dish or a very popular appetizer!